Elektra is the popular assassin from Daredevil comics and she was brought to life in a 2003 movie. 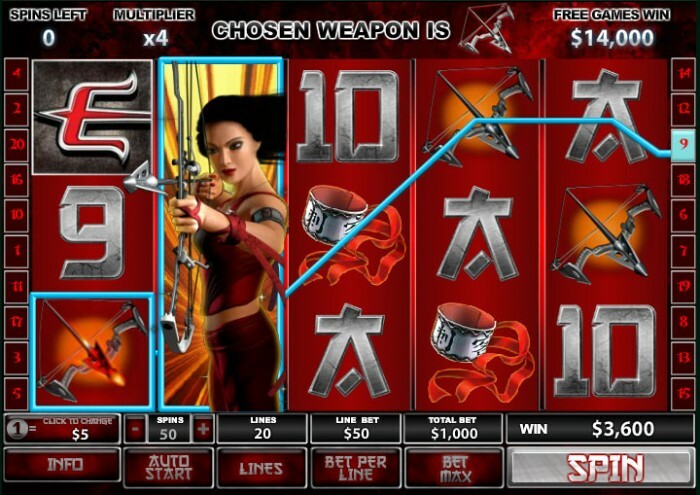 PlayTech has created a slot game featuring the Elektra character and the imagery on the slot captures the ominous nature of this anti-heroic character. Elektra does name appearances in the form of her own brilliantly designed symbol. Be on the lookout for the symbol because it reflects a very helpful wild. Be mindful of the arrival of the Elektra logo because it represents the scatter symbol, a symbol that could set winning a lot of money in motion. What of the other symbols in the game? Not surprisingly, Elektra’s favorite weapons, the karate sais and the Shuriken throwing stars are among them. Elektra’s trademark armband and pendant are as well. The traditional “playing card” symbols have been tweaked a bit to reflect Japanese characters. This way, their presentation harkens to the martial arts training Elektra received early in her life. With the right combination, these symbols could make playing the Elektra slot game a lucrative endeavor. Five reels are pretty standard for these slot games and the 20 paylines are less than the traditional 25. Do not worry about the lesser number of paylines because the chance to win money increases. The minimum coin size to play is .01 and the highest is 5.00. With 20 paylines, that means the total number of coins you can play is 1,000. A huge payout is possible with the subsequent 5,000 coin jackpot. The number two jackpot payout is 1,000 and that is not exactly bad either. Everyone who looks for big result wants to see the wilds and scatters show up during a spin. By the way, the autoplay function allows you to pre-program a large number (or a small number) of spins in advance. Regardless of how you arrive at a wild or a scatter, their presence delivers a very positive outcome. The goal here is to win money and these feature symbols definitely present that possibility. Once again, the wild symbol is Elektra herself. She only appears on Reels 2, 3, and 4. Getting a wild is pretty good, but do not just look for Elektra alone. There are other symbols that present some really excellent benefits. As soon as three of more Elektra logos show up on the reels, the “Weapons Bonus” is here. Players have a choice of a single weapon from three that are offered: The Sai, the Shuriken, and the Bow. The Sai gives you 10 free spins, the Shuriken presents 14 free spins with double payouts, and the Bow gives 7 free spins and a massive quadruple payout. During these free spins, the wild becomes an expanding wild – another plus! The graphics and visuals with these symbols are quite brilliant. The Shuriken, for example, rotate in a very realistic manner and the arrows released by The Bow turns red hot at the tip. Little touches such as these truly do add quite a bit to the visual style of the slot. Elektra participates with the Marvel Mystery Jackpot that is connected to other Marvel slots. Keep your eyes open for the special symbols related to this jackpot as they could lead you to winning far more than you thought possible. The Elektra slot delivers. While not the most feature packed of slot games, Elektra definitely does provide a nice chance of winning a good payout and the creativity of the symbols makes sessions easy on the eyes.